Look at the character 正 /zhèng/ CORRECT, RIGHT, JUST, PROPER… You see how clean and well-organized it is – no wonder it means CORRECT, JUST. 正在 /zhèngzài/ indicates that some action is happening right at the moment that we refer to. As always with our multimedia stuff – the sound is a critical part of this piece, so make sure to use a good quality headphones for the best experience. Learning should always be an inspiring and spirit-elevating activity, not something that you have to force yourself to do. Therefor learning materials should be something that you are looking forward to – and not just something that you use because there isn’t anything better. “Good enough” isn’t good enough. We live in 21st Century and that means that learning materials should finally take full advantage of technical and creative possibilities that are available to us now. Here is my vision of how it can look. 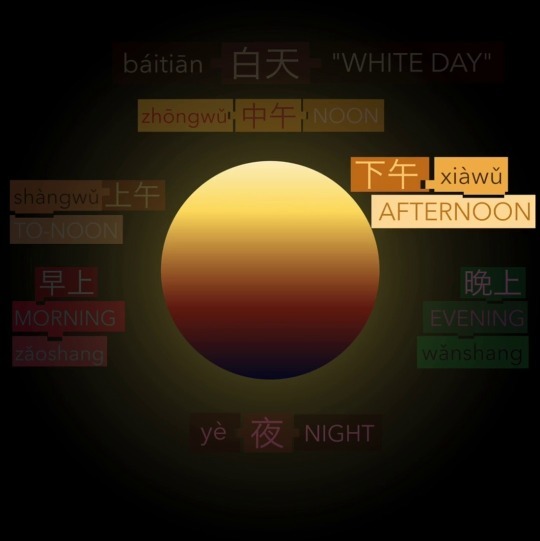 Chineseffect proudly presents: Phases of a day. The primary meaning of 对 /duì/ is OPPOSITE – in the sense THE OPPOSITE SIDE, or even TO OPPOSE something. If you are often with Chinese people, you often hear this 对 /duì/ in the meaning YES, THAT’S RIGHT. It sounds illogical, but there is a reason for that. Imagine that you put two things that are opposite each other close to each other so that they are actually touching – and you find that they FIT just RIGHT. The fact of fitting is 对 /duì/. Anyway, today is time for grammar, so we will look into another function of this word. 对 /duì/ is a very important preposition. When you want to say that something is too expensive FOR you or that smoking isn’t good FOR health, you use 对 /duì/. 对 /duì/ if FOR – but not in the sense that we have bought something for someone, but in the situations when we are describing attitude TO something or influence of one thing TO another. Basically we take a phenomenon and put it OPPOSITE us (or someone or something else), we CONFRONT ourselves with it and say what the result of that confrontation is. Part of words A MANAGER, TO MANAGE, REGARDLESS. I like to teach this character with the sentence I DON’T CARE WHAT THE MANAGER SAYS. Primary meaning of 经 /jīng/ is A CANON (that is the official text or a sum of official texts of a particular culture). When something has ALREADY happened, we can find a mention of it in A CANON. So it shouldn’t surprise us that we find the character 经 /jīng/ in the word ALREADY. When we have ALREADY been through something, we have THE EXPERIENCE. We also find 经 /jīng/ in the words ECONOMY, DIRECTOR and OFTEN. You will find all these words in practical and beautiful form of interactive flashcards, along with Chineseffect Dynamic Sentences HERE. Do you know why Chinese people like the number 8? Because the pronunciation of 8 八 /bā/ is similar to 发 /fā/ SEND and 发 is a very pro-active and therefor positive word (part of the word TO GET RICH btw). Chineseffect is Reinventing Mandarin for The Digital Age. Chineseffect is Reinventing Mandarin for The Digital Era. In which words do we find this character?